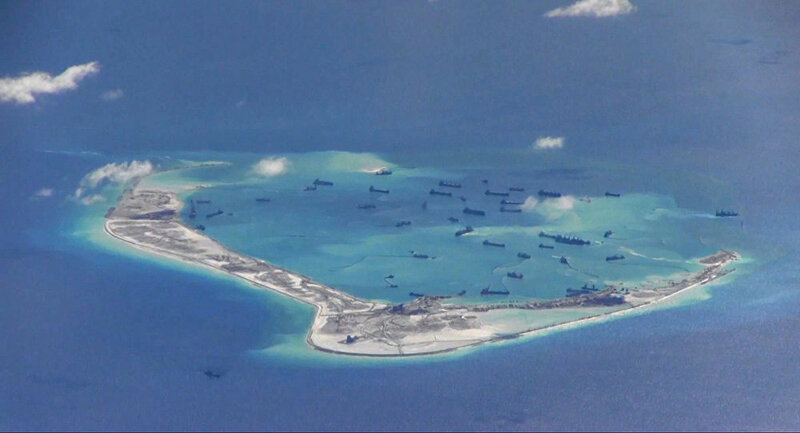 The ship sailed around Mischief Reef, in the Spratly Island chain. The reef was seized by China from the Philippines in 1995. In 1995, China launched large-scale construction works on the Mischief Reef, turning it from a water-covered coral island into an artificial islet. Currently, the islet houses four large hangars for bombers, 24 small hangars for jet fighters, four anti-aircraft systems, two radars, a cement factory and piers. The Mischief Reef is located less than 150 kilometers from Philippines-controlled Palawan Island and is part of the Philippine exclusive economic zone. However, Beijing claims that the reef is China’s territory with 12-mile territorial waters. The Chinese Defense Ministry accused Washington of militarization of the South China Sea region, following the sailing of the USS Dewey near the Mischief Reef. "China expresses strong protest and has already made representation to the US side in connection with such a demonstration of military force, boost to the militarization of the region and actions that can easily lead to incidents at sea and in the air," ministry representative Ren Guoqiang said. Ren pointed out that the US ship entered waters of the disputed archipelago, which China claims sovereignty of, without permission. It was the first such patrol since October and the first one conducted under US President Donald Trump, according to The Wall Street Journal. Previously, Trump denied proposals from the military to conduct such patrolling in the region. Analysts suggested that the Trump administration wanted to ease pressure on Beijing over the South China Sea, in exchange for China’s assistance in putting pressure on North Korea. Diplomatic Bromance: Will Xi Jinping's 'Old Buddy' Terry Branstad Resolve US-China Differences? Experts say that this freedom of navigation operation was aimed at calming those of Washington’s allies that rely on its support in the standoff with China. "America’s allies were growing increasingly anxious and China was encouraged by the Trump administration’s passivity on maritime issues. This freedom of navigation operation comes a week before an important defense ministers meeting in Singapore and will be greeted with relief by most of the region," Tom Wright, a foreign policy expert at the Brookings Institution, told The Financial Times. "Freedom of navigation in the western Pacific is too important to be traded away for dubious Chinese pledges of cooperation on other issues, even if they are as important as North Korea," Andrew Shearer, an expert at the Washington-based Center for Strategic and International Studies, told the newspaper. However, the question remains why Trump waited for four months before launching a freedom of navigation operation. Dmitry Mosyakov, an expert at the Institute for Oriental Studies of the Russian Academy of Sciences, suggested that the move was a reaction to rapprochement between Moscow and Manila during Philippine President Rodrigo Duterte’s recent visit to Russia. "It is no surprise that the US destroyer was sent to the Mischief Reef which was mentioned in Manila’s lawsuit against Beijing in The Hague. Although China ignored the ruling of The Hague tribunal, Beijing intensified contacts with countries involved in territorial disputes, including the Philippines and Vietnam, promising them economic benefits from cooperation. The US could not ignore this fact," Mosyakov told Sputnik. Pivot to Russia: Is Philippines Drifting Away From US Amid Putin-Duterte Talks? According to the expert, the basis of Washington’s policy in Southeast Asia is the so-called hedge policy, which means cordoning China with a number of small countries to put pressure over it. "The fact that now China is taking the lead in the region is a problem for the US. This is why they sent a ship to the Mischief Reef," he said. According to Mosyakov, Washington’s policy on the South China Sea is still unclear and it is hard to say how it may change. "In terms of a global standoff between two powers, this is very dangerous and may result in a conflict," he concluded.